More intelligent white goods from Samsung’s Vienna show with the OmniPro Microwave. Not only does the OmniPro cook your food, it knows how much to cook your food and makes helpful suggestions based on the weight and humidity of the items you put in it. Packing both weight and humidity sensors in the stainless steel case, you select what type of food you’ve put inside (bread/vegetables/meat) and how well you want it done (soft/al dente etc) there’s an LCD display which suggests an appropriate cooking time. 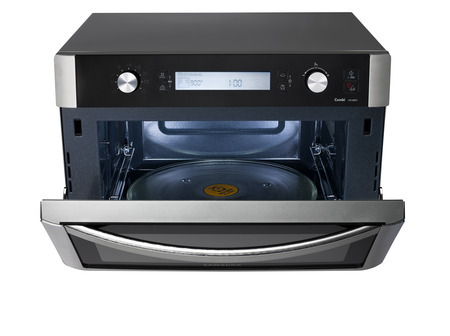 You can set it to stop when the food is defrosted or fully cooked. Samsung claim this is both better for you – food will be cooked and also better for the environment – if you use only what you need, you require less energy. Checking it out “in the flesh” the OmniPro is a bit of a mammoth creation with a 36litre capacity and measuring WxHxD (mm): 520 x 403 x 453, so think about how much space you’ve got in your kitchen before launching in with this one. It’s also got some accessories like the appealingly-named “Crusty Plate” – intended for grilling browning and baking pizzas and so on as it transmits the heat to both top and bottom of the dish. Your way of presentation is really too good.I amtotally impressed by your post.I am looking for your more updates.Keep themcoming. Very interesting. I hadn’t thought of some of theseInteresting piece. It can be difficult to find good blogs nowadays. Found onehere though by the looks of things. The main thing which I like most in this micro wave is thatit gives us the suggestion based on the weight and humidity of the items youput in it.